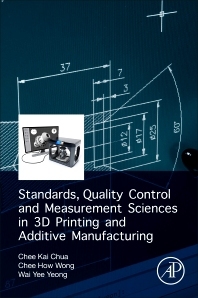 Standards, Quality Control and Measurement Sciences in 3D Printing and Additive Manufacturing addresses the critical elements of the standards and measurement sciences in 3D printing to help readers design and create safe, reliable products of high quality. With 3D printing revolutionizing the process of manufacturing in a wide range of products, the book takes key features into account, such as design and fabrication and the current state and future potentials and opportunities in the field. In addition, the book provides an in-depth analysis on the importance of standards and measurement sciences. With self-test exercises at the end of each chapter, readers can improve their ability to take up challenges and become proficient in a number of topics related to 3D printing, including software usage, materials specification and benchmarking. Executive Director of Singapore Centre for 3D Printing and a Professor at the School of Mechanical & Aerospace Engineering in the College of Engineering at Nanyang Technological University. Associate Professor & Associate Dean at the School of Mechanical & Aerospace Engineering in College of Engineering at Nanyang Technological University.